Images of Giovanni De Rosalia: Playwright, Poet, and "Nofrio"
Giovanni De Rosalia, born in Sicily in 1864, moved to New York City sometime before 1907 where he became popular among Italian immigrants in the Teatro Italiana di Varietà. His original farces featured the character Nofrio, a Sicilian immigrant bumpkin who found himself embroiled in one situation after another. De Rosalia played the role of Nofrio in addition to authoring and directing the plays. Between 1916 and 1928, he recorded nearly two hundred of his popular skits. Those recordings sold nationwide and gained him a loyal following. He published numerous plays and farces, as well as a few collections of poetry during his lifetime. Nofrio's legacy is preserved only in special library archives and in private collections. I hope you enjoy these images gathered from my research, which began with a handful of 78 r.p.m. Nofrio recordings from my grandfather's collection. In 1907, De Rosalia began to recruit actors for a classical drama company. He abandoned "serious" theatre after a while, but continued his pursuits as a Sicilian dialect actor and writer, creating "siciliana newyorkese" farces, featuring Nofrio as the protagonist. Many of De Rosalia's Nofrio skits were published by La Follia di New York, a popular Italian American entertainment newspaper. Though only a handful of these works still exist today, they constitute a significant contribution to the literature of Italian American theatre. The troupe would perform continuous shows, sometimes going from 8:30 p.m. until 2:00 a.m., featuring music, dance and an occasional film. Not only a talented playwright and actor, De Rosalia was also a skilled poet who published some collections of Sicilian and Italian verse. Among his early works was a book entitled Raccolta di brindisi per ogni occasione in dialetto siciliano (A collection of toasts for all occasions in Sicilian dialect). Written in verse, some are clever tributes for holidays like Easter or Christmas. Others are poignant toasts for special occasions such as weddings and the like. This collection of toasts was published in 1916. 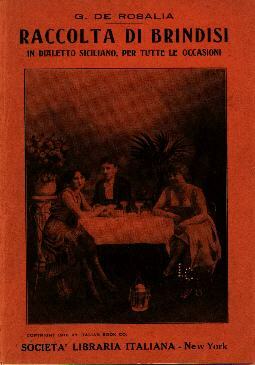 A major work, Amuri chi chianci: versi siciliani (Love that cries), was published in 1923. De Rosalia was very successful in making his farces widely available on disc, recording nearly two hundred titles between 1916 and 1928. These were not the full-length sketches he and his company performed on stage, but instead were skits pared down to about three minutes each and featuring only two or three characters to advance the plot quickly for the 78 r.p.m. format. 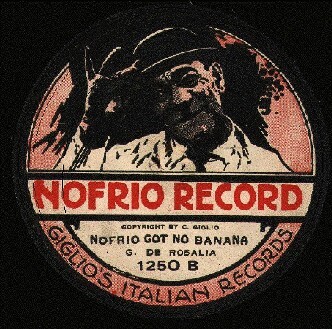 For a brief time in the early 1920’s, De Rosalia even issued records on his own “Nofrio” label. Most of Nofrio's two hundred recorded farces were made on the Columbia, Victor, and Okeh record labels. These ethnic recordings are now quite rare and few have survived over the years. 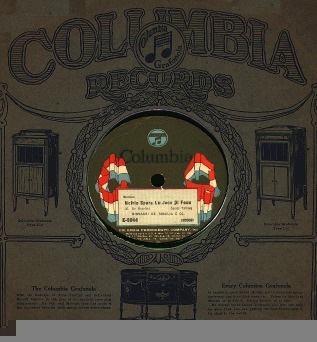 A favorite one is Nofrio Spara Lu Jocu di Focu (Nofrio shoots off his fireworks), recorded in 1923 on the Columbia label and pictured here in its jacket cover. 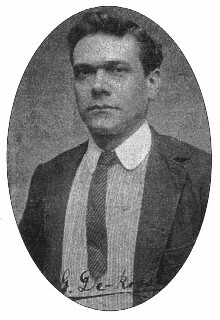 Giovanni De Rosalia died in 1934. Today, only a few of his works, printed and recorded, can be found in private collections and library archives. For the English translations, go to the Sicilian-American Theatre page on Art's excellent Web site. If you like the Marx Brothers, you'll enjoy these Nofrio farces. * The full version of "Giovanni De Rosalia: Playwright, Poet, and Nofrio" by Joseph J. Accardi has been published in the Summer 2001 issue of Italian Americana (Vol. XIX, No. 2, p176-200). Italian Americana is a semi-annual historical & cultural journal devoted to the Italian experience in America, and is published in cooperation with the University of Rhode Island and the American Italian Historical Association. Il Progresso Italo-Americano. (New York: Barsotti & Polidori). Newspaper published 1880-1989. Very special thanks to Art Dieli, Sicilian language scholar, for his translations and enthusiasm. Thanks also to J. Kirk Bonner, Sicilian language scholar, for his interest. Special thanks to Dr. Emelise Aleandri, author of The Italian-American Immigrant Theatre of New York City (Charleston, SC: Arcadia, 1999) and Little Italy (Charleston, SC: Arcadia, 2002) for her advice and contributions. Emelise is the Artistic Director for Frizzi & Lazzi, The Olde Time Italian-American Music & Theatre Company (http://www.frizzilazzi.com/) in New York City. 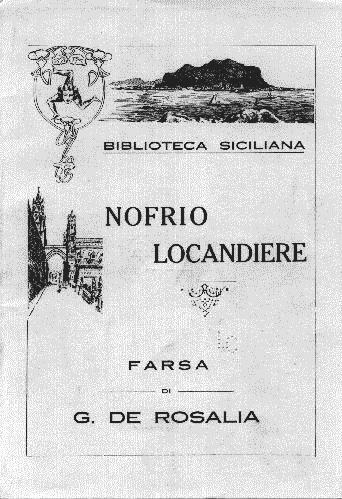 Nofrio Locandierie was staged by Frizzi & Lazzi in NYC on February 11, 2003 for a fund raising program called Love Sicilian Style on behalf of the American Italian Cultural Roundtable, Inc.
And a heartfelt thanks to my aunts Sadie and Liz for saving grandpa's records.